The most famous martyr to emerge from the Diocletian persecution (c. 303-305) is St. George of St. George and the Dragon fame. There is little that is known for sure about George, but it seems he was a young Christian tribune from Palestine chosen to guard the Roman Emperor Diocletian (reigned 284-305 AD). 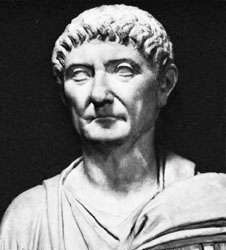 We know that Diocletian trusted only Christians to guard him, so that part is maybe true. When Diocletian’s edict for all soldiers to perform the sacrifice to the pagan gods was issued in early 303, George refused, denounced the pagan edict and confessed himself a Christian in front of Diocletian’s court. The legend goes that Diocletian was very fond of George and offered him money and lands to renounce Christ. George refused and Diocletian had no recourse but to have him executed. He was decapitated at Nicomedia April 23, 303 and his body was returned to his hometown of Lydda (modern-day Lod southeast of Tel Aviv). About 20 years later, Emperor Constantine built a church consecrated to him in Lydda. Ancient textual and historical evidence indicates there was a soldier named Georgios (George) executed in Nicomedia at the time of the Diocletian persecution, that George was from Lydda and that Constantine built a church there honoring him shortly after his death. A church in Lod (Lydda) built partially on remains of a 12th-century Crusader church and in whose basement is the tomb of St. George. St. George, however, is not known for these scant historical facts. He is known as St. George the Dragon Slayer from the medieval Golden Legend, a compilation (in c. 1260) of all that was then known, and perhaps embellished over the centuries, of famous early Christian martyrs and lore. In the Golden Legend a “dragon” was terrorizing a village and would only be appeased by the offering of a daily sheep for its feast. 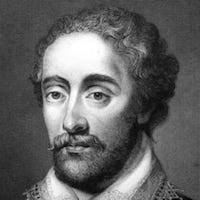 When no sheep could be found, lots were cast for a maiden to sacrifice and the lot fell to the monarch’s daughter. Her father’s money and power could not save her, so she went to the lake where the dragon lived and awaited her fate. George, on his horse and in military garb, came upon the scene and after making the sign of the cross, killed the dragon and the princess was saved. All the pagans in the town became Christians. What bits of truth can be gleaned from this story? George was a soldier; he was a Christian; and perhaps was able to kill or overcome something that was threatening a town or his hometown. 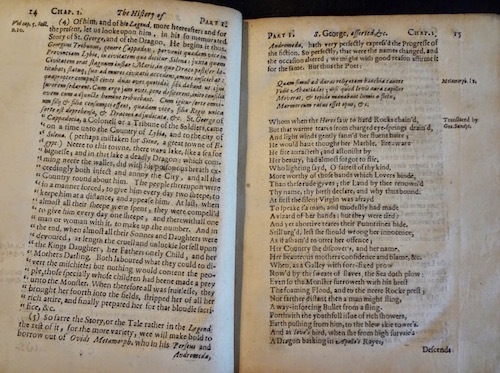 There may have been a young girl involved, or this may be medieval romantic fantasy. He became a hero and many people gave their lives to Christ because of his bravery or his example. Due to the medieval Golden Legend, however, George has become the archetype of all who through holy physical prowess save and slay. 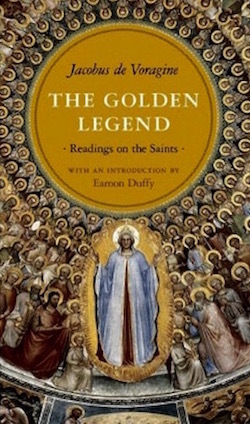 Whatever may be glimpsed from the Golden Legend and the historical information on St. George is dwarfed by the impact of his life on the ages. 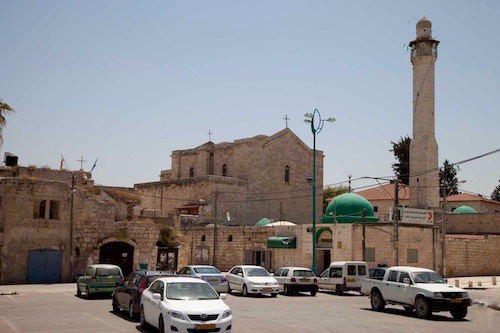 The church Constantine erected to honor his martyr’s death in the early 300’s has been continually destroyed and rebuilt over the last 1,700 years and the one erected over the site in 1870, the Church of Saint George in Lod, Israel, is still standing. St. George has been able to unite Christians, Jews and Muslims. In Muslim Sufi literature George is called Khidr and is one of the four prophets Islam believes are still alive and immortal. The other three are Idris (Enoch), Ilyas (Elijah) and Isa (Jesus). 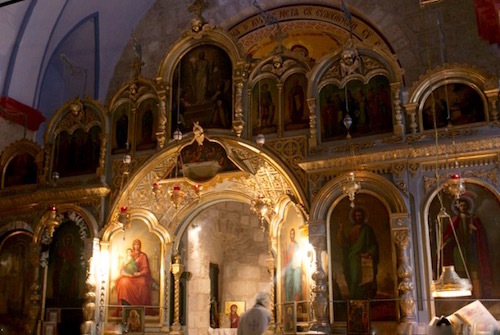 Muslims, Christians and Jews to this day go to the rather shabby Eastern Orthodox shrine of St. George at Beit Jala near Bethlehem. 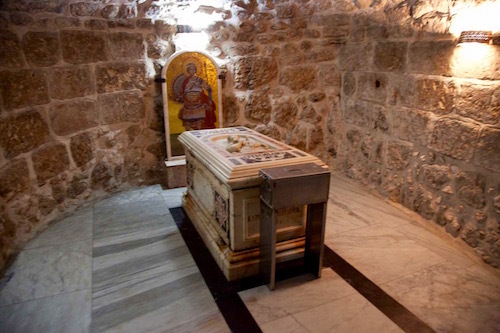 Jews believe Elijah is buried there. Christians believe it to be the birthplace of St. George and Muslims come to ask Khidr, St. George, to help them with illnesses, mainly mental problems. 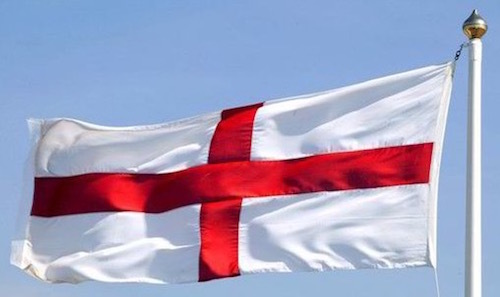 Even though George has no connection to Britain that can be validly ascertained, the English have particularly embraced St. George. 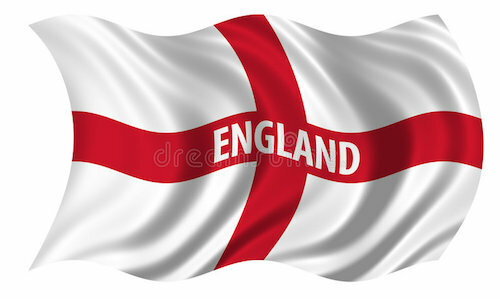 He is the patron saint of England and the St. George flag, a red cross on a field of white, is one of the official emblems of England and of the Most Noble Order of the Garter. St. George Day, April 23 the day on which he was martyred, is still celebrated all over the world: in Hungary, Lebanon, Syria, Spain, Canada, Russia, Albania, Bosnia, Serbia, Bulgaria and, of course, in the Caucasus country of Georgia named after St. George. 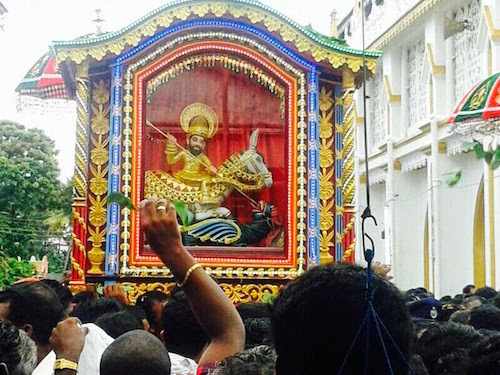 The Christians of India reverence him and the Hindus pray to St. George the Dragon Slayer believing he will protect their children from cobras. In Edathua, India there is the St.George Forane Church (below). 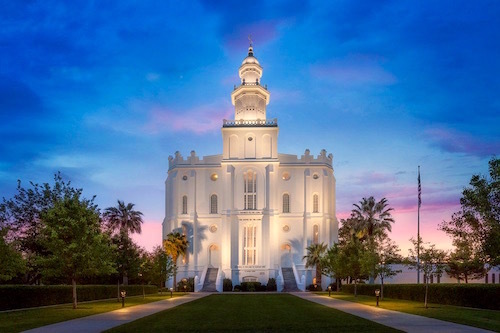 The Mormon Latter Day Saints have a temple in St. George, Utah called the St. George Utah LDS Temple (below). Both town and Temple are named after George. It causes amazement that one little life and one heroic death so long ago and so far away can have such an historical impact on so many religions in so many places for so many centuries. 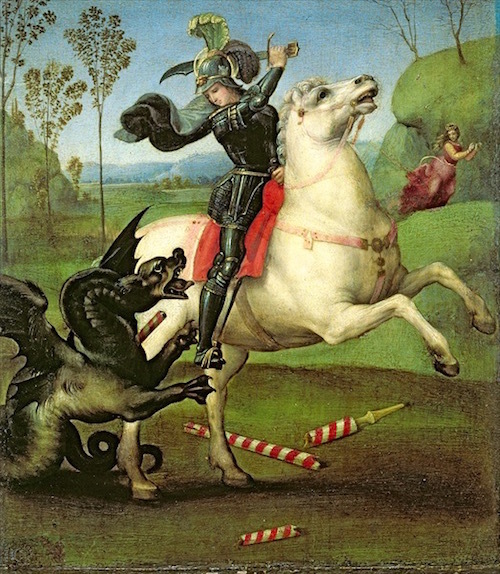 Why is St. George as the Dragon Slayer so universally revered?